Gotham: Episode 3 - Who is The Balloon Man? Who in world is “The Balloon Man”? That was the first question I asked myself when I heard about this episode. Is he a DC villain in the guise of a different name, or is he an original character? After watching the promo for the episode, I was pretty sure I had it all figured out. 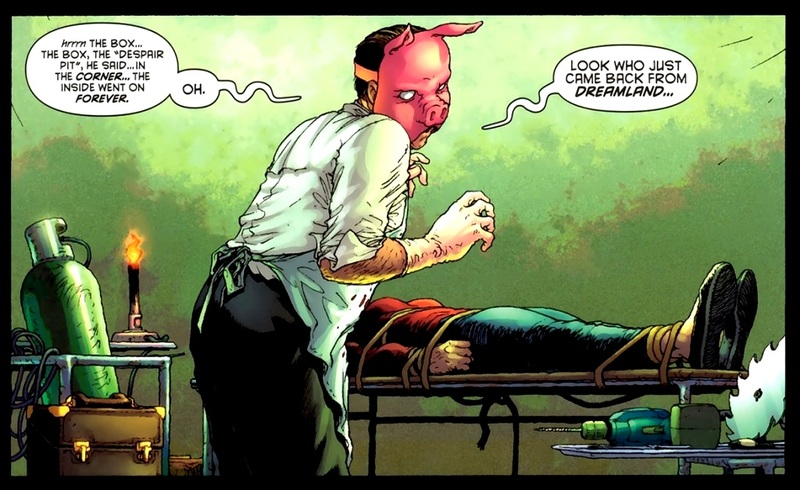 “The Balloon Man” would be the precursor to…Professor Pyg (Lazlo Anton). Or so I thought. I mean all the pieces seemed to fit together. The promo featured a man in a pig mask. He employed balloons to commit his murders (the grandiose and circus aspects are part of Pyg’s calling card). There was even a character named “Lazlo” on the IMDB cast list for the episode. Who else could it be, right? Well…I was wrong. Turns out, “The Balloon Man” is a child services worker turned vigilante targeting some of Gotham’s high standing yet corrupt individuals. I will not mince words. This episode was very slow. The main plot seemed to drag from one murder to another, while Gordon and Bullock try to play an ever slower catch up with the killer. The plot was a generic police procedural, with none of the spice from the last two episodes.Fortunately, the episode is able to win back some points with some very juicy subplots. Once again, Robin Lord Taylor has done a fantastic job as Cobblepot. The character is written and performed perfectly. He is courteous, crazy, charming, awkward, dapper and adorable all at the same time. In many ways, this is what I imagine Cobblepot would be like in his younger years: a sycophantic, manipulative little toad, but still very deadly. This episode, he returns to Gotham and proceeds to kill a man to take his job at a restaurant. As Oswald buses tables, he bumps into the powerful proprietor of the establishment…Boss Maroni. It is always exciting when a character is translated onto the screen. The show runners clearly know how to cast and David Zyas fits the bill perfectly. He’s clearly younger than Falcone but we can tell that he’s been in the business for quite sometime. He takes immediate liking to Oswald, telling him he was similar at his age, foreshadowing Cobblepot’s destiny as a crime boss of Gotham. While Maroni did not have a lot of screen time, it is clear that he will be an important figure in this season as well as a mentor to young Penguin. In the wake of “The Balloon Man’s” killing spree, Gotham’s citizens rally behind this figure. The people are tired of the corruption and the crime. Vigilantism has already begun to take hold in Gotham. This is significant because it begins to change the “Batman Mythos” in a profound way: that Batman is not Gotham’s first vigilante. At the end of the episode we see Bruce’s interest in “The Balloon Man” as well as his disagreement with his methods. Thus, Gotham becomes a city already prepared for someone to take the law into their own hands. While there were some positive points, the overall episode was a “filler.” Even still, I do believe that this was done on purpose. Part of great marketing is leaving your consumers hungry for more. With the next episode titled “Arkham”, I feel the show runners made a conscientious decision to make this week’s episode a little slower. After all, a lull before the storm makes it that much more magnificent.